The Good Shepherd is an intriguing, adult film. Adult, not merely because it’s rated “R”, but because it depicts the difficult and problematic professional and personal life of a CIA operative with an adult, realistic approach that is rarely shown in films. What we typically see when the CIA and its agents are depicted in movies, is the operative on an exciting, though dangerous, overseas assignment. There may be frequent cuts to a large corner office in Langley, Virginia, at which sits perhaps, Morgan Freeman, talking tensely on the phone to the agent, usually trying to prevent him from taking some unauthorized, dangerous, but righteous action. Even when the CIA is portrayed as a malevolent force, we are typically watching a discrete episode. Not so, The Good Shepherd. In this film, we follow the growth of the CIA through the career of Edward Wilson, played by Matt Damon, from his recruitment as a student at Yale into the OSS (the predecessor agency to the CIA) before World War II through his supervisory role in the Bay of Pigs debacle in 1961. While at Yale, Wilson, almost reluctantly, becomes a Skull & Bones member. From that rarified circle, the salient elements of his adult personal and professional life are irrevocably formed. Wilson is willingly recruited by the OSS’ founder, based on “Wild Bill” Donavan, but named “Sullivan” in the movie. Robert De Niro, who also directs the film, makes the most of this small but significant role. A one-night stand with Clover (Angelina Jolie), the promiscuous sister of a fellow Skull & Bones member and a senator’s daughter to boot, results in her pregnancy. Wilson is obligated to “do the honorable thing.” Their marriage is soon distant and loveless. Wilson’s son is the only one for whom he can feel (but barely show) any affection. Wilson’s career begins with his thorny initiation by the British intelligence service into the murky world of espionage, where he is taught the lessons of intelligence the hard way. Michael Gambon gives a delicious performance as his teacher. Wilson rises within the newly formed post-war CIA as the Agency expands during the Cold War period. A strange duet begins when he meets his Soviet intelligence counterpart, known as “Ulysses” (Oleg Stefan). That dance between spy and counterspy accelerates with the escalation of the Cold War. And the higher Wilson advances in the CIA, the more he neglects his family. 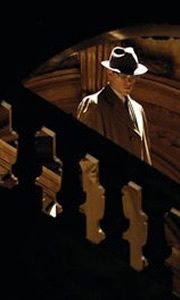 The dénouement of the film involves Wilson’s moral crisis when he must choose between his commitment to his family and to the CIA and country. Much is made in the movie of Wilson’s persona as an honorable, patriotic WASP, who became extraordinarily repressed and secretive after he discovered his father’s suicide and suicide note at age six. Wilson’s degree of secrecy is exemplified by his keeping the suicide note secret and neither opening nor reading it until well into his adulthood. I certainly don’t know any normal person who could do that. One message that reverberates throughout the film is that in his world, Wilson can trust no one. Wilson is purportedly based on an actual CIA intelligence officer who was so secretive and paranoid that few in the Agency knew what he looked liked. But, in the world of espionage, where deception must often be necessary, being distrustful must be just part of the job. But not all the tens of thousands of CIA employees are like Edward Wilson. I have been to the CIA headquarters in Langley, Virginia (and as the old saw goes, if I told you what I was doing there, I’d have to kill you). I walked in the halls and ate in the cafeteria. All the people I saw and met seemed like normal people having a normal day at the office. Most of the employees are analysts, not operatives, but still, it strikes me that, if we are to assume that Edward Wilson is a prototype CIA employee, The Good Shepherd is furthering a cliché. As Wilson, Matt Damon doesn’t move a muscle in his face or change his expression for the entire 2 ¾ hours of the film. A wonderful tight performance or just plain under acting? You decide. And one wouldn’t typically think of casting Angelina Jolie as a rejected wife. She simply looks too good for the part. The Good Shepherd’s outstanding supporting cast, including John Turturro, De Niro’s superb direction, and the first-rate screenplay make up for any small imperfections in the lead performances. To cut to the chase…The Good Shepherd tells a compelling, complex, personal and political story and tells it extremely well. It’s an engrossing film.